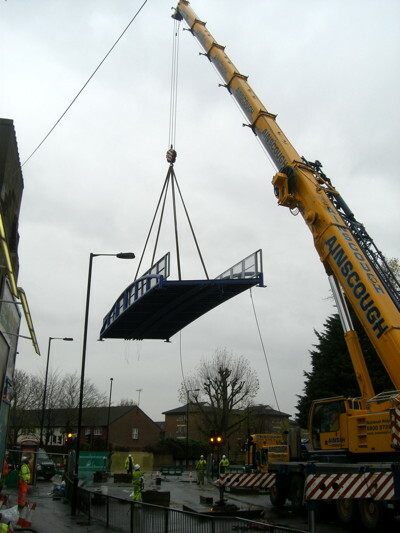 A new pedestrian and cycle bridge was lowered into place over Rotherhithe New Road near South Bermondsey station on Saturday. The new bridge was installed on Sunday as part of the Lottery-funded Sustrans Connect 2 project. It replaces a disused Victorian railway bridge which was removed in September and cut up for scrap. The 4 metre wide modern bridge made of steel will carry pedestrians and cyclists over Rotherhithe New Road to South Bermondsey Station and beyond. “It is fantastic to see the old rusty bridge gone and a purpose built crossing put in its place,” said Cllr Barrie Hargrove, cabinet member for transport. “The good news is that despite the forecast bad weather, we finished ahead of schedule and the bridge is now in place. “This has been another hugely successful and efficient operation led by Southwark council and its contractors. “We are looking forward to this modern replacement bridge being officially opened to the public from January 2013. Bryn Lockwood from Sustrans said: “It’s great to see this new dedicated walking and cycling bridge go in after all the effort of local people and thanks to their vision and perseverance in making this project happen. What is the council doing to stop the Tesco Express on Southwark Park Road using the pavement as an extension to their store and why are their delivery lorries permitted to block the traffic thoroughfare rather than use the parking bays on a regular basis? The parking bay was installed for the purpose of providing car parking for visitors to local stores. The dimensions of the bay are unsuitable for accommodation of large delivery vehicles although there is not a loading ban in operation in this area. Observations have shown that vehicles making deliveries to the store are too large to fit wholly within the parking bay. Delivery vehicles then extend onto the double yellow lines or, if the parking bay is occupied by a car, double park. This is causing obstruction of the westbound traffic lane. Currently this can only be dealt with by issuing parking tickets on the vehicles causing the obstruction. Tesco’s transport consultants have indicated that they would be prepared to pay for a five metre west-ward extension of bay and changing its use so that only delivery vehicles can park in it during certain hours (8am-11am) and by shoppers outside of those hours. It is noted that the extension of the bay would only be possible with the removal of the adjacent plane tree and approximately five metres of footway. A proposal will be brought to the local community council for a decision within the next three months. Regarding the cages on the footway, we have brought the issue to the notice of the store manager and will continue to inspect the area and take enforcement action when we find evidence of an obstruction on the highway. Read SE1’s story from the first round of voting; voting ends Friday 8 June and all other details are the same as before. Bermondsey and Canada Water stations are among the first 80 London Underground Stations to be fitted with wifi equipment as part of a deal with Virgin Media. The service should be up and running before the start of the Olympic Games at the end of July. Internet access will be free during the summer; pricing has not yet been announced for the autumn and beyond. “Our customers will soon be able to connect to the internet for live travel information while they are on the move through stations,” says Gareth Powell, London Underground’s director of strategy and service development. “Bringing a next generation wifi service to one of the world’s oldest underground transport networks is progressing as planned and the forthcoming service is testing well. Parts of Canada Water Station will also be covered by the London Overground’s new wifi service which will be provided by The Cloud. Transport for London is considering whether it can reopen the public toilets at Canada Water station, says Simon Hughes MP. The MP says a TfL source told him that the public toilets at the station were closed last year because of ‘safety concerns’. However, Mr Hughes has discovered that although there was a report of a serious assault, the subsequent police investigation found this report to be false. “I understand TfL’s reasons for closing the public toilets at Canada Water tube station a year ago,” he said. “However, I do not think it is acceptable that they did not follow up with the local police to find out whether their safety concerns were legitimate. “Directing commuters to use either the toilets in the Canada Water library or the toilets at Tesco Surrey Quays is far from ideal. Posted in River Thames, Royalty, Transport. Trains passing through Canada Water Underground station will be much busier during the Games due to the Jubilee line services already being full with spectators travelling to and from events at ExCeL, North Greenwich Arena and the Olympic Park. It will be very difficult to board Jubilee line trains at this station at the busiest times, especially in the morning and evening. via Canada Water | Get Ahead of the Games. Bermondsey station will be exceptionally busy in the morning peak between 7-11am. It will be very difficult to board eastbound Jubilee line trains due to spectators travelling to venues in the Olympic Park and at ExCeL and the North Greenwich Arena. via Bermondsey | Get Ahead of the Games. The Queen and Duke of Edinburgh will visit Greenland Pier on the morning of Wednesday 25 April to name the new royal row barge ‘Gloriana’ that has been built for the Queen’s Diamond Jubilee Pageant in June. ‘Gloriana’ was lowered into the water for the first time on Thursday at Isleworth. The royal visitors will stop off at Greenland Pier on their way to Greenwich for the reopening of the Cutty Sark and the opening of the Royal River exhibition at the National Maritime Museum. Greenland Pier will be closed on Wednesday morning and the westbound services at 0944; 1004; 1029; 1059 1129 and eastbound sailings at 1055 and 1113 will not stop at the pier. “KPMG Thames Clippers are delighted to provide Greenland Pier for this important event and apologise to customers for any inconvenience caused to your intended journey,” said the company in an email to passengers on Friday.